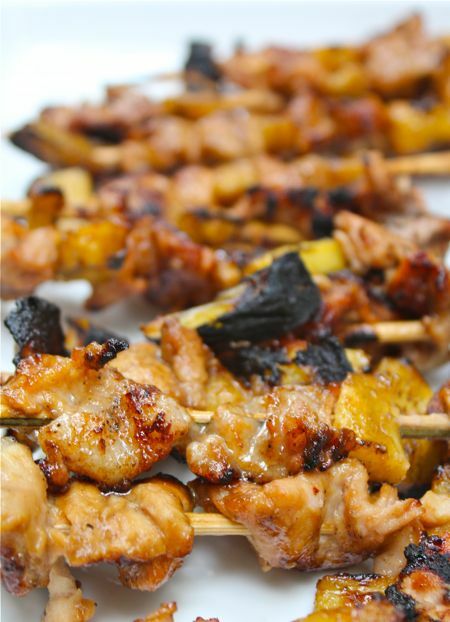 The pork was then skewered onto the bamboo sticks, with pieces of freshly peeled pineapple in-between the pork. 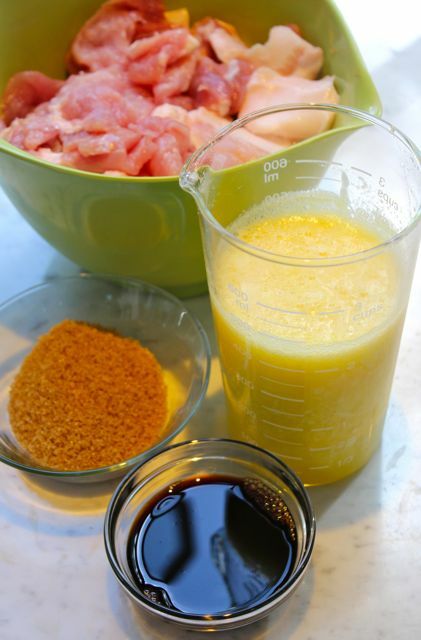 The leftover marinade was placed in a small saucepan and brought to a boil, with a touch more brown sugar added and seasoned with salt and pepper. I didn’t taste this until it had boiled for several minutes, and it seemed to be a nice balance of sweet and sour. My tongue still got a little itchy despite the pineapple juice having been boiled. …but they looked really appetizing and smelled amazing. 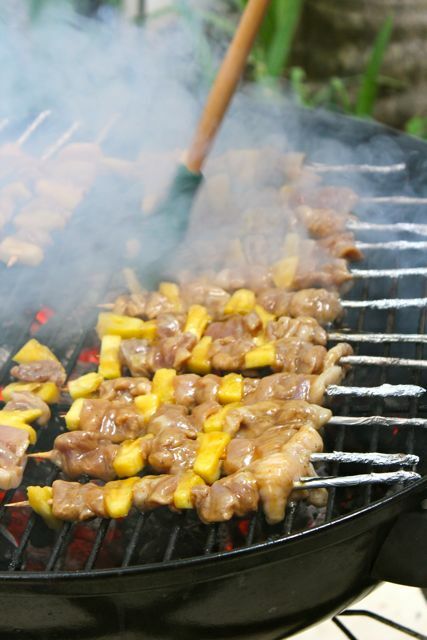 We were all getting quite hungry, and some of the crew who are big on pineapples in food were already counting on several sticks of this version of barbecue! Hello MM the taste of pork marinated in fresh pineapple is different from canned ones? canned ones tastes better? I also mentioned before that I am SOLD on using almost pureed onions as tenderizer…not only does it add flavour, but it tenderizes the meat as well!!!! I take it that the problem was the pork sat too long in the marinade? And I suspect, the marinade’s concentration too (after reading BettyQ above). You know I often brag that I eat all results of my experiments, even the failed ones but I have to admit in all honesty, once in a while, the garbage bin is the only safe receptacle for them. You don’t even want to imperil your pets’ wellbeing. 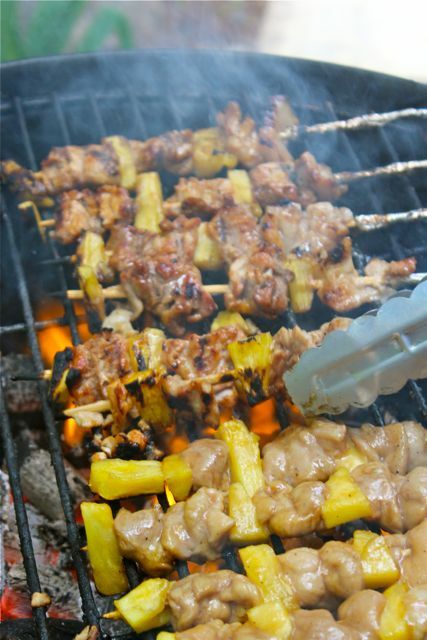 I had my take on your V1& V2 BBQ this weekend..like Betty Q,i almost,always finish them in the oven, after grill marks on them.They are so good.I did pork stick with canned pineapple before,they were edible,not memorable. MM…this is what I did over the week-end last Friday…bear in mind I did this 2x totalling 20 POUNDS of pork!!! The catsup, I add to the basting sauce. OK…season first the pork with salt/pepper and massage the pureed onions into the meat. Let it sit for about 2 hours, then add the rest of the ingredients. Let it sit for a few hours to overnight. Then thread into water soaked bbq sticks and grill over medium to high heat. Now, you can put the almost cooked pork and let it rest on the rack above the grill. If anyone, wants the street vendor bbq, try this! My son’s friends called it that! MM…please allow me to ask Kurzhaar or Gejo something…I was really thrilled to receive my PURPLE SIGARILYAS SEEDS. However, I am getting VERY impatient guys about my Winged Bean (sigarilyas)! It is taking FOREVER to germinate!!!!!!!!!!!!!!!!!!!! I soaked it in warm water till they became swollen and even made a tiny scratch on the surface of the hard coat…NADA!!!! I did the things above about 3 to 4 weeks ago. Is there anything I am missing? whoa! At least the pictures are drool-worthy! For me, calamansi juice does an excellent job of tenderizing and flavoring as well. bettyp, that’s a lot of barbecue! Have you visited your allergologist/immunologist?Maybe a desensitization therapy will be helpful? Millet…mabigat lang iyong buto ng pork shoulder! 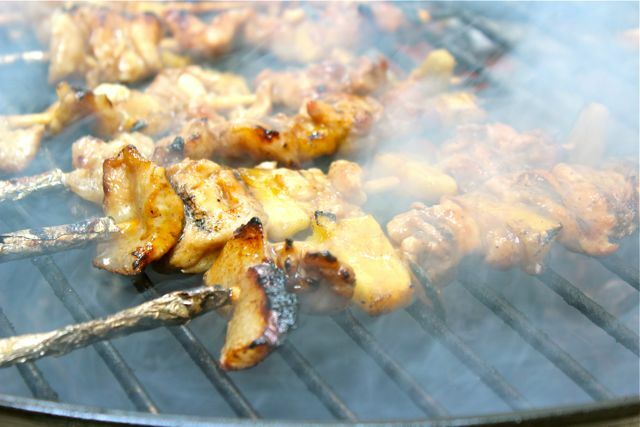 PLus, I would rather grill a lot since we just love leftover pork bbq…makes excellent filling for Banh Mi sandwiches and Vietnamese Salad Rolls! 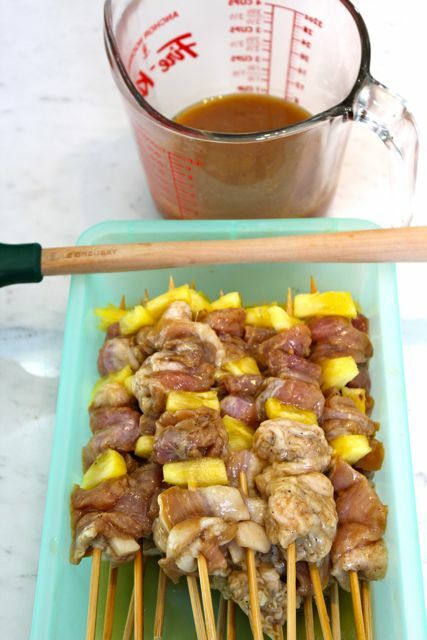 When I started reading this post and saw the cup of pineapple juice on the second picture I said to myself “oh no” but looking at the rest of the pictures of the cooked sticks I thought “ok, maybe not” until I read your last paragraph and I laughed and said, “yup, been there, done that” haha. Except I used beef. Tasted like mush, disgusting alright. Anyone tried canned pineapple juice to marinate? I would think that pineapple would give the bbq sticks an awesome flavor. MM are you from nasugbu? I notice that you mention the town often., I just came across this blog site and i really enjoy the threads, very informative esp to our kababayans who miss authentic pinoy cooking from backhome.